Gary Rhodes, the famous British celebrity chef and Masterchef UK Judge, came to Indonesia on 23 October 2015. Held a cooking demo at Tribeca Park, Central Park Mall, Jakarta, for GREAT Britain Food and Drink Festival, he shared his simple yet pleasurable menu, Salmon with Fennel Salad. Using British fresh ingredients, it can always be substituted with local ingredients. 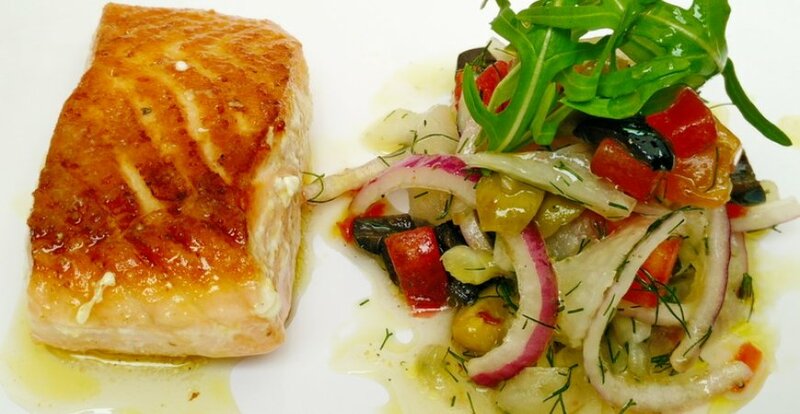 “I found that Scottish salmon is perfect for this dish. However, you can substitute it with your favourite fish,” said Gary. A good dish is not only tasty, but also pleasurable for eyes. Corn flour does this magic for fish. The result is nice colour on the salmon plus the bonus of easier cooking process as it prevent the fish from sticking on the pan. Colourful salad also attracts every hungry guest. Fennel with its sweet flavour have distinct licorice aroma. Olive with its strong flavour adds more kick to this salad. “For salad, I like to use red onion as it is sweeter and have milder aroma. However, you can also use white onion,” said Gary. In order to pop the real taste of fresh ingredients, Gary uses honey lemon dressing for the salad. Honey lemon dressing is one of the easiest dressings for salad. The key for making it is balancing the taste between lemon and honey so that it does not overshadow each other’s flavour. Good quality extra-virgin olive oil is required in this dish to bring the salad to life. - Mix all of salad ingredients except arugula. - Mix all of dressing ingredients. Adjust the taste. - Sprinkle the salmon with corn flour, and then cook the salmon on low heat for 5-6 minutes. - Add butter and spoon it to salmon while it cooks. - Put the salad on the plate, garnish with arugula. - Place the salmon besides the salad.